KZPT, a producer of special helmet based in Poland, has chosen the transparent and heat-resistant polycarbonate (PC) Apec FR 1892 from Bayer MaterialScience for the visors of its fire helmets. As introduced, Apec FR 1892 includes a flame retardant (FR stands for flame retardant) with good heat resistance. 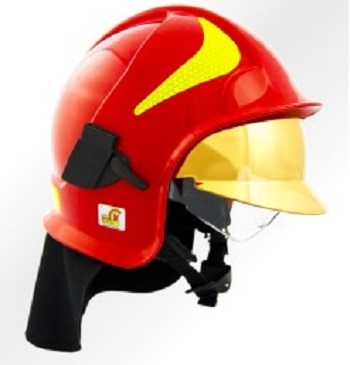 It satisfies the European standard EN 443:2008, among others, which specifies particularly stringent requirements for the protective function of fire helmets. This standard stipulates that the visor must keep flames, heat and sparks away from the wearer’s face. Premium helmets, such as the KZPT Calisia Vulcan, are even equipped with two visors made of Apec FR 1892 to provide greater protection. The outer visor is coated with vaporized metal and reflects the heat more strongly than the simple variant. Bayer adds that the material’s good flow properties also allow for efficient processing. The finished visor features a smooth, glossy surface.KZPT uses the injection molding process at its site in Kalisz, Poland, to produce visors used primarily by firefighters in eastern European countries and the Middle East.